As an example, the Diamond Jubilee 100x1st Business Sheets were printed by both De La Rue and Walsall with the top panels carrying the two different FSC codes (De La Rue : C020244, Walsall : C023216 respectively). International Security Printers is a group name that includes Cartor and Walsall. Thus, when this is quoted by Royal Mail, the FSC code needs to be referred to in order to determine the printer in the group that actually printed the product. 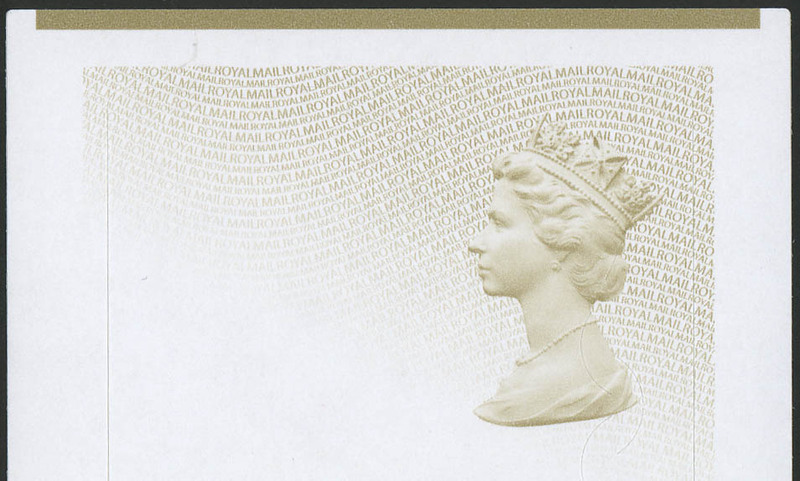 The 12x2nd Booklet has now surfaced with the original 'ROYAL MAIL' text in the substrate backing paper (SBP1) for the hidden codes MTIL and MI8L. 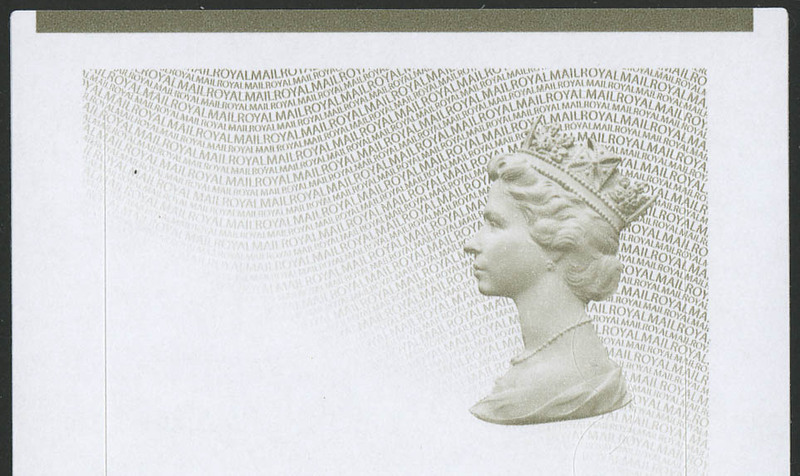 The wavyline 'ROYAL MAIL' text is upright. The First Class version of the Machin Post & Go Label has now appeared with the Year Code 17. The code format has changed from 'MAI6' of the previous year to 'RI7YAL' which has been used for Special Issue versions for sometime. 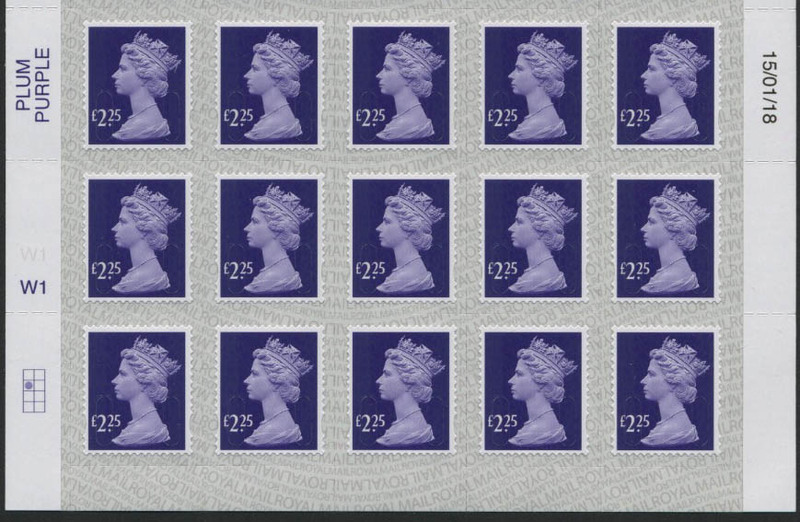 The code can be found in line with the Queens nose in a central position and so depending upon the overprint it may well be obscured. Three more Walsall counter sheets were officially issued on 4th December 2018 (the SD 100g and SD 500g had already been found at Post Offices previously). 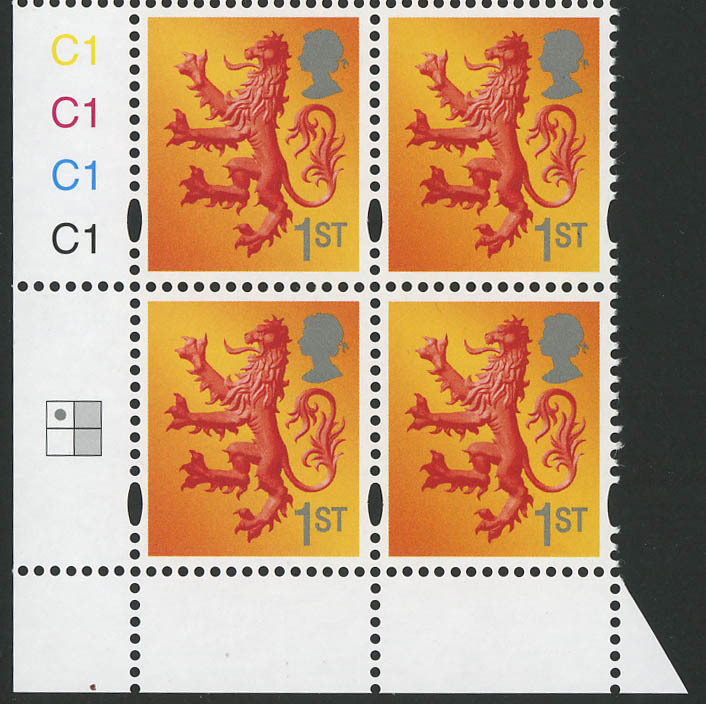 Reprints of the Scotland Country Pictorial 2nd and 1st class NVI stamps were issued on 6th November 2018. Both have 4xPlate C2 numbers and the printing date was 27/08/18. 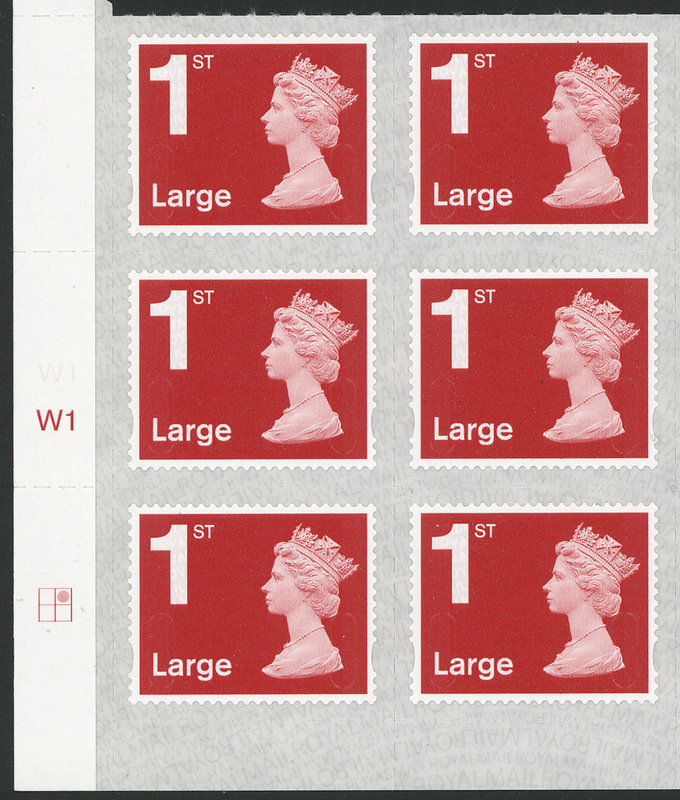 In January 2016 a new self adhesive paper substrate was introduced having a repeating wavyline 'ROYAL MAIL' text appearing on the backing paper (under the stamps). This was given a code 'SBP1'. Subsequently, a modified version superseded this - two lines of upright repeating wavyline 'ROYAL MAIL' text followed by two lines of inverted repeating wavyline 'ROYAL MAIL' text and was coded SBP2. In early October (late September) 2018 the 6x1st booklets with Padlock covers were found with the original SBP1 paper substrate (hidden codes MSIL and MI8L). 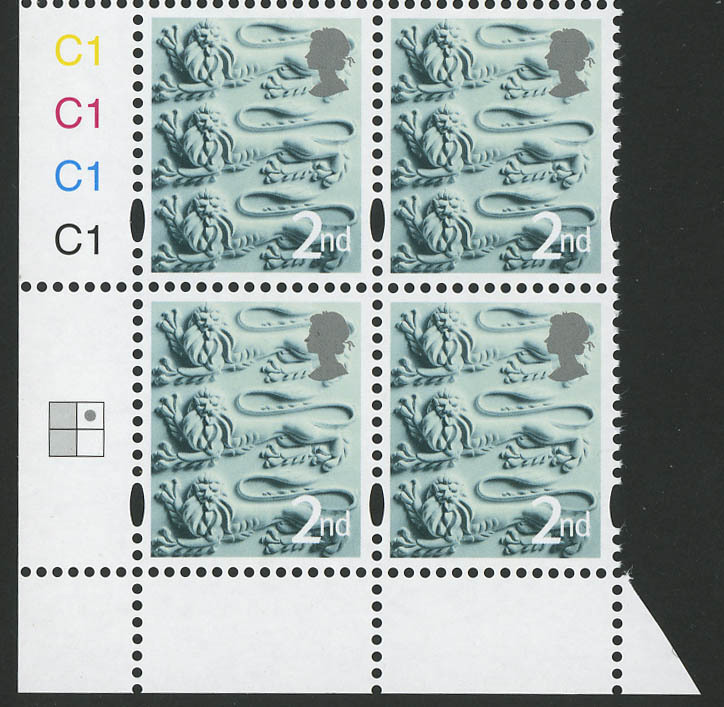 These had already been issued in the year with the SBP2 substrate. Now, the Harry Potter custom retail booklet has been found to exist on both SBP1 and SBP2 substrates (hidden codes MCIL and MI8L). Further Walsall printings were issued on 23rd May 2018. These included the NVI 1st and 1st Large values. 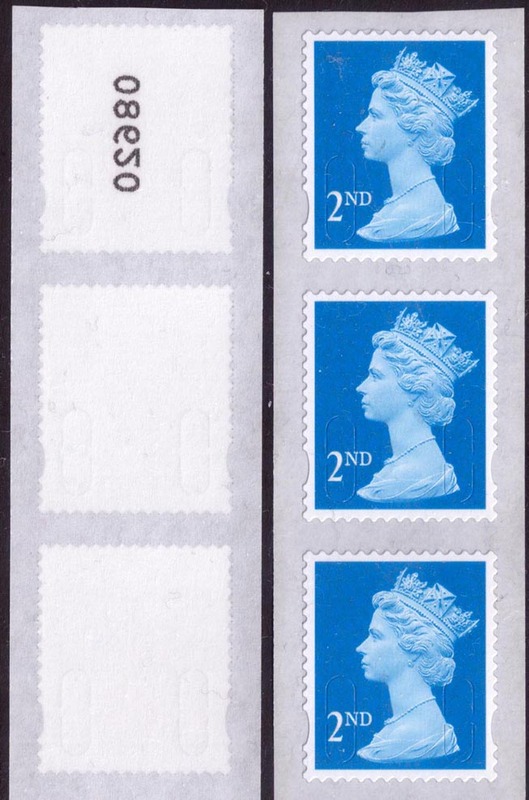 Both came in counter sheets of 50 (as with the previous De La Rue printings) but the primary sheet laydowns were different from the Walsall denominated values which came in sheets of 25 and so there is a different set of Grid Box Positions. Walsall took over the Counter Sheet printing contract from the start of 2018 so all year code MI8L counter sheet printings were produced by Walsall. The first Walsall printings for the year were the new tariff values issued on 20th March 2018. These and subsequent sheets do not exhibit a sheet serial number and the 'printing date' is pre-printed using a gravure cylinder. Sheet printings with the year code MI8L were all printed by Walsall. Two Post & Go labels were issued on 23rd January 2018 with the Game of Thrones theme, one for the second class rates and one for the first class rates. These both used the now standardised Year Code forms of - CLI8S for the Second Class rate and RI8YAL for the First Class rate. For Christmas 2017 the Winter Greenery Post & Go labels (first issued in November 2014) were re-issued on 13th November 2017. Both the Second Class and First Class Designs were re-prints and have new Year Codes - CLI7S for the Second Class rate and RI7YAL for the First Class rate. The Remembrance Poppy for 2017 was re-issued on 24th October 2017. The format of the hidden year code was changed to RI7YAL (as used for the Royal Mail Heritage - Mail by Air issue). The latest Post & Go Labels taking the theme Royal Mail Heritage - Mail by Air were issued on 13th September 2017. The designs include First UK Aerial Mail 1911, Military Mail 1919, International Airmail 1933, Domestic Airmail 1934, Flying Boat Airmail 1937 and Datapost 1980. The format of the hidden year code has changed to RI7YAL for this issue - this is positioned just left of the pictorial image and about half way down. With the introduction of the revised (upright / inverted) 'ROYAL MAIL' text in the Self Adhesive paper substrate we have the possibility that printings can yield a new variant depending upon how the paper was reeled. This has now happened with the counter sheet £1.17 value. 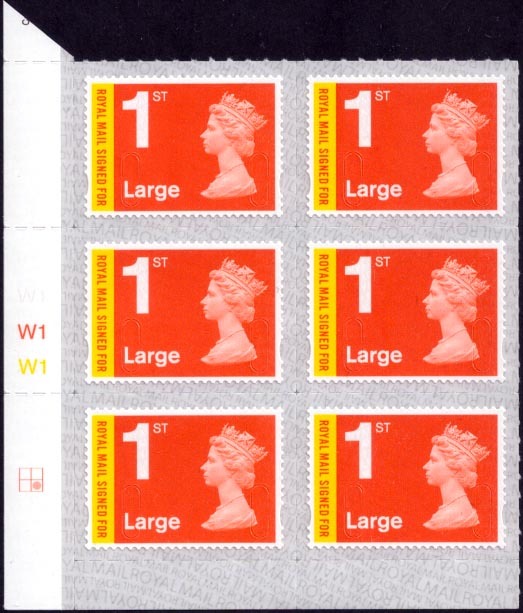 The second printing in March 2017 (printing date 03/03/17, this was the first printing with the new substrate) was issued with the paper direction that was different from the Walsall 100x2nd Business Sheets (see section 'Revised ROYAL MAIL Self Adhesive Substrate - January 2017' below). Subsequently, a third printing occurred in April 2017 (printing date 07/04/17). This has a different paper direction - which is in fact the same as the first Walsall 100x2nd Business Sheets. This paper substrate has a reference code 'SBP2' and 'SBP2i' for the inverted version. For simplification, if the two lines of upright text are considered, we have L(arge) text followed by s(mall) text for the upright substrate - SBP2 and s(mall) text followed by L(arge) text for the inverted substrate - SBP2i. Click here for a listing of the latest known variants. Two new value Pictorials for each of the four Country Designs were issued on 21st March 2017. These use the same two designs as used previously. The value tablet typeface has been changed to that used by the Machin definitives. Over time, the 2nd and 1st NVI values will also be printed using the revised typeface. 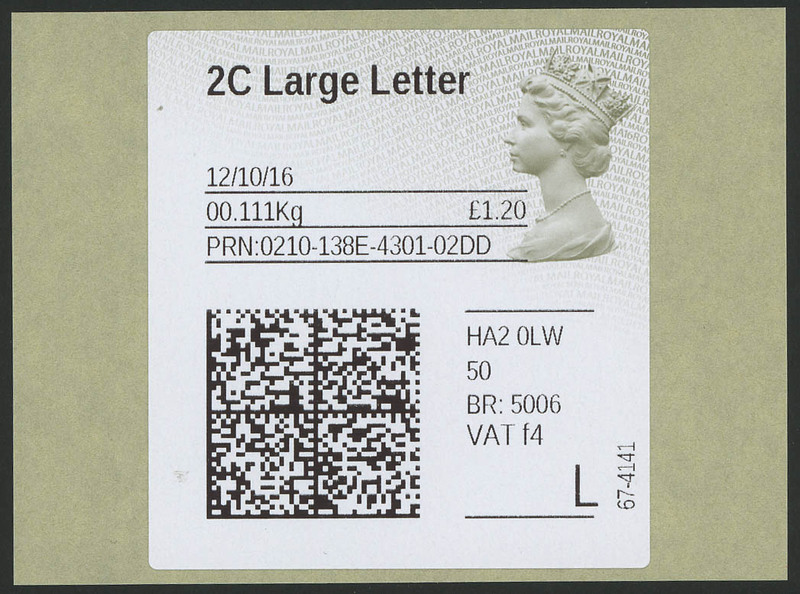 Note: The five new values issued on the 21 Mar 2017 were printed in Jan 2017 on the 'old' self adhesive substrate (no wavyline 'ROYAL MAIL' text). A subsequent reprint in early Mar 2017 was made using the new self adhesive substrate with wavyline 'ROYAL MAIL' text (these were issued on 7 Apr 2017). 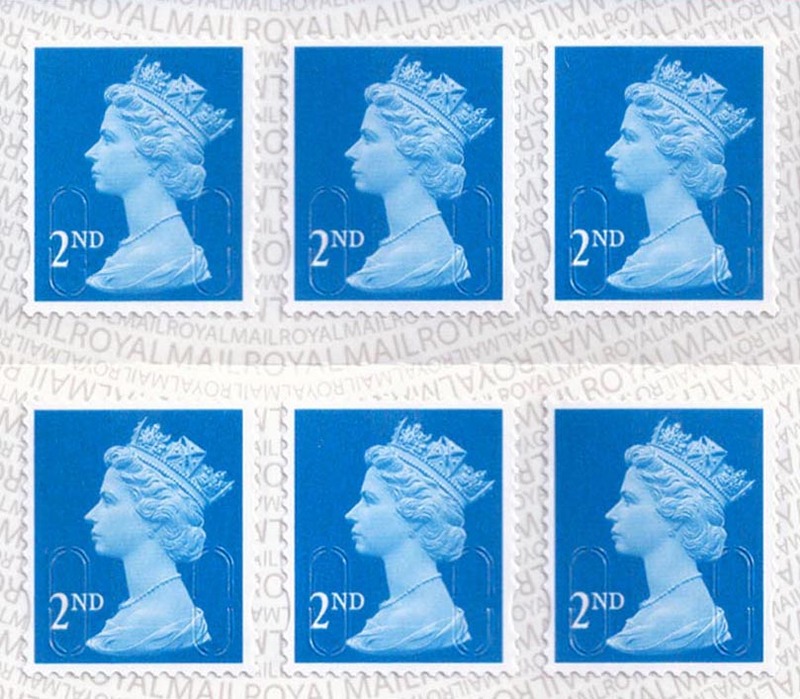 The self adhesive substrate with the 'ROYAL MAIL' wavyline text under the stamps (on the carrier paper), has been issued in a new form. Alternating pairs of lines of the text are now in either upright or inverted orientation. Apparently, this has been done to aid in the production process. 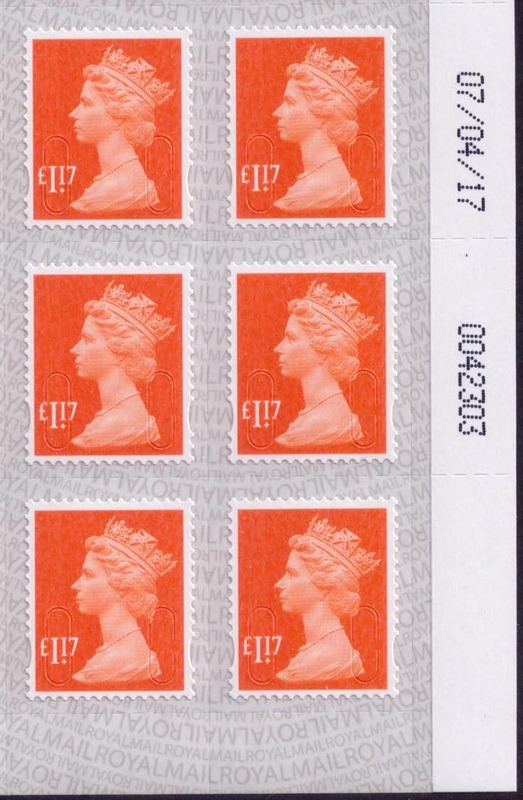 It first appeared in late January 2017 and has been found on the 2nd class Business sheets of 100 dated 15/12/16 - the stamps have the year code 'MI6L'. 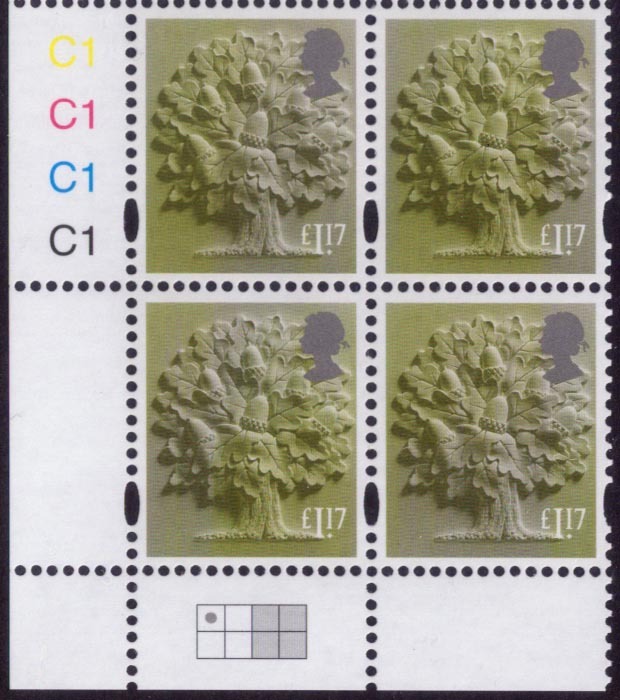 Booklets and Counter Sheets will follow in due course (Don Staddon reports in March 2017 Stamp Magazine that the 1st Class counter sheet version has been printed - date 09/12/16 and year code 'MI6L'). The ‘ROYAL MAIL’ text printed on the substrate (carrier paper) is made up of the following four repeating lines. The Post & Go 'Remembrance' Poppy label was reintroduced on 24th October 2016. Post Offices, in the main, seem to have new stock with the Year Code MAI6. However, in a number of instances, Royal Mail Series II machines seem to be using old stock with the Year Code MAI5. Changes to Booklet and Business Sheet covers in conjunction with a change in Royal Mail corporate livery were issued on 20th October 2016. The change involves the use of a new typeface family called 'Chevin'. 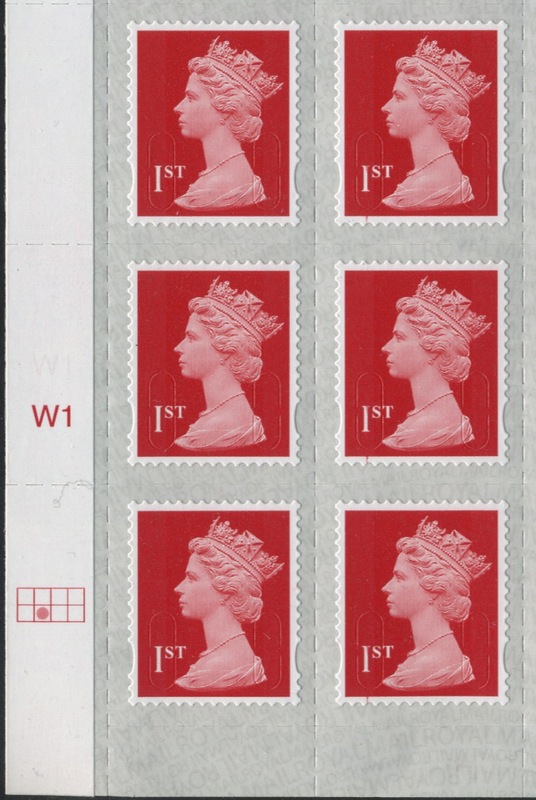 The 1st Class NVI colour Royal Mail Red has been reformulated and now appears in a noticably darker shade (this applies to both covers and stamps). An upgrade to the Post Office Post & Go NCR Machine network is being rolled in the course of the coming months. Machines will be installed with a third printer that will vend a new style of Open Value label (similar to the present large Horizon Labels). 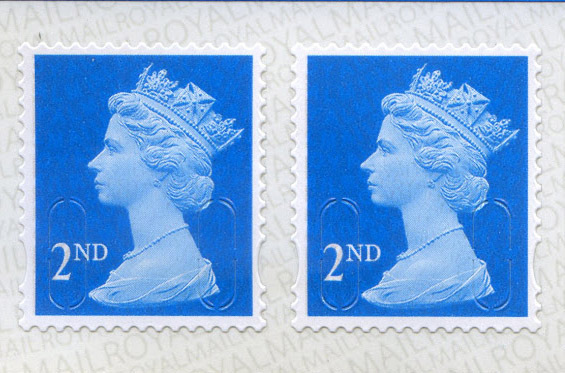 These new larger labels have a hidden date code MAI6 which occurs just behind the band of the Queens diadem. They don't carry phosphor bands and don't have die cut perforations. These new style of Open Value labels are vended for items over 100g. The first five offices to start providing these new labels came on-line on 20th September 2016. The Postal Museum Post & Go RM Series II machine has a new overprint running between 14th September and 11th November 2016. The additional text is 'King Edward VIII 1936' with an odd crude Logo (80th anniversary of the issue of the King Edward VIII 1d). The overprint applies to both second and first class Machin labels. Autumn Stampex (14th - 17th September 2016) had Post & Go RM Series II machines vending the Poppy Label with 'The Battle of the Somme' and Tank Logo overprint. The Post & Go Machin label in Bright Blue (Cyan) has been printed for the year 2016. The wavyline text has been changed so that the large lines of text that were the repeating 'ROYAL MAIL' strap are now '2nd CLASS' (this was first used for the Winter Fur and Feathers issue in 2015). The hidden year code is now in the form CL16S and is located in a central position opposite the Queens eyeline. 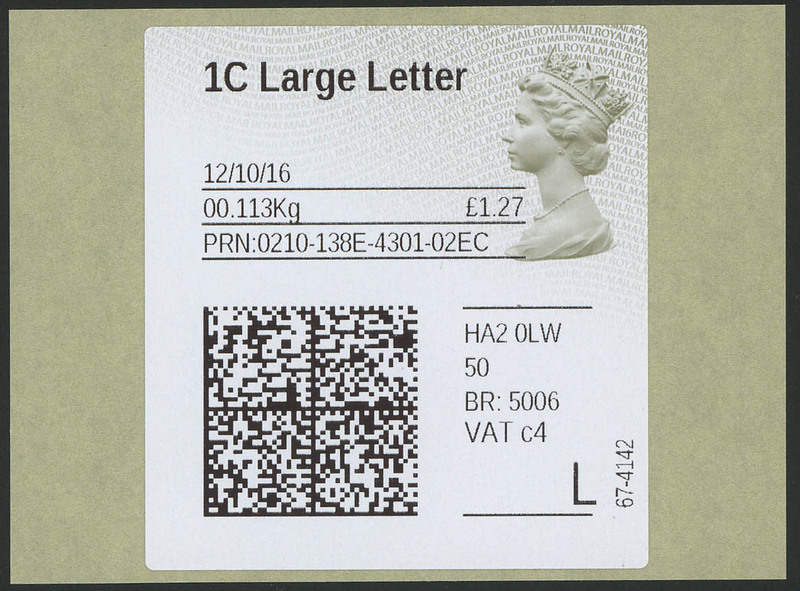 New printings of the 2nd Class NVI England and 1st Class NVI Scotland definitives were made on 19/05/16. 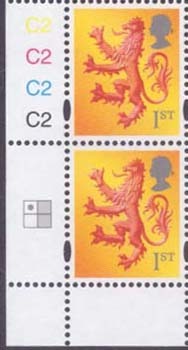 The Scotland design now uses only four plates - the Queens Head and Value Tablet is now a grey colour (these were silver previously). The new design of Horizon label was issued late in 2015. These were in a yellowish brown colour similar to the Post & Go labels with the hidden code MAI5. Apparently, the printers had used an incorrect Pantone colour for these and the 2016 printings have reverted back to the spec colour of olive brown. 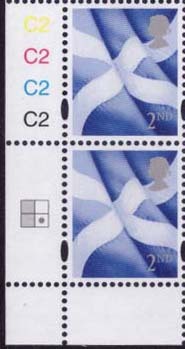 A new printing of the 2nd Class NVI Scottish Saltire Flag design has appeared. This was from a new Plate layout which provides a grid box with four positions. A printing date of 23/02/16 has been recorded for this new combination. 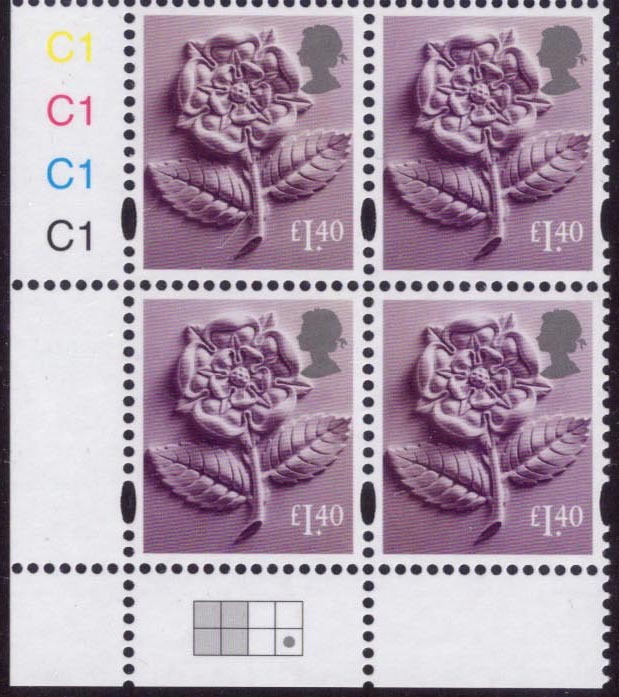 Interestingly, only four ink colours have been used so that the Head and Value Tablet now appears grey (previously these had been printed with an additional silver plate). A Special Limited Edition of the Prestige Booklet was available priced at £59.99. This had a Silver and Gold cover and each booklet was numbered (only 1926 were produced). Pane 3 had the central label produced in gold foil. Royal Mail Heritage Transport Post & Go labels were issued on 17th February 2016 for The Postal Museum Post & Go machine. The six designs depict a Post Boy (on horseback) 1640's, Mail Coach 1790's, Falmouth Packet Ship 1920’s, Travelling Post Office 1890’s, Airmail 1930's and Royal Mail Minivan 1970's. In a change, the usual six tariff rates were not available just one value - the '1st class to 100g'. On the same day a software modification was made that affected the Machin design labels. This was the left justification of the Museum Logo (originally, the Logo was indented). Royal Mail Heritage Transport were issued on 17th February 2016 for Post & Go machines. The six designs depict a Post Boy (on horseback) 1640's, Mail Coach 1790's, Falmouth Packet Ship 1920’s, Travelling Post Office 1890’s, Airmail 1930's and Royal Mail Minivan 1970's. The year code is MAI6. Additionally, the Travelling Post Office 1890's - Locomotive design was produced by Walsall in Digitally Printed single design rolls (as the Sea Travel - Hong Kong design last year). Again, the phosphor was printed in gravure over the complete pictorial portion on the label. 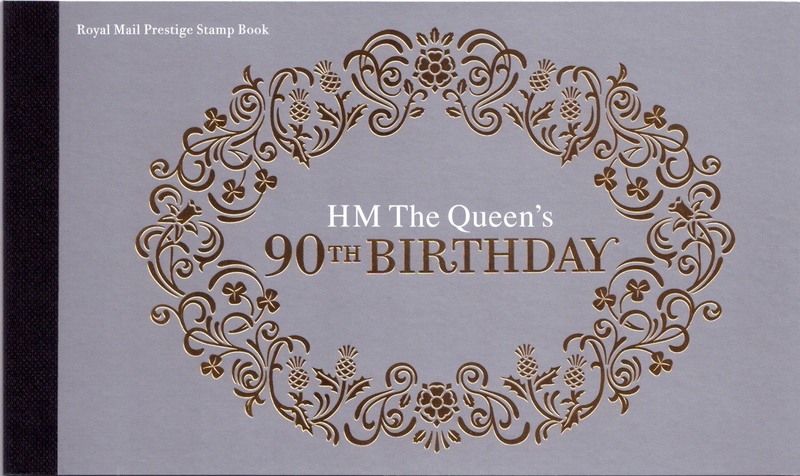 Spring Stampex was held between 17th and 20th February 2016. An exhibition overprint was available on the Post & Go Machin design vended on RM Series II machines. 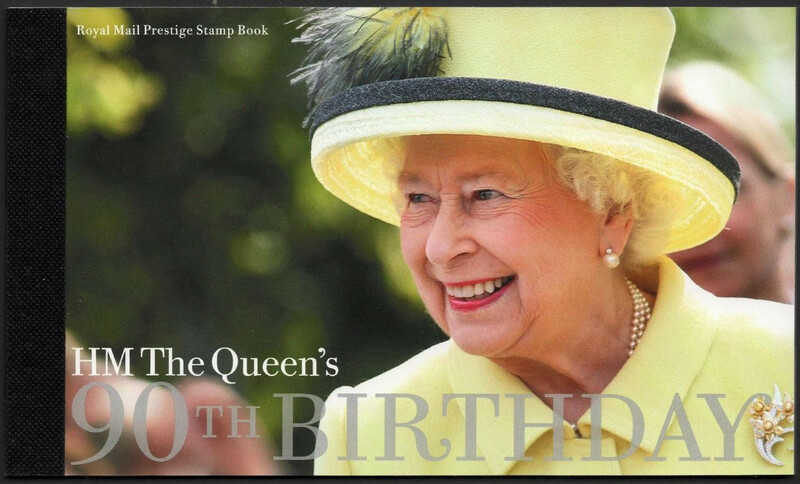 The additional text included '500 Years of Royal Mail'. These occurred with hidden year codes MAIL and MAI3. From the 1st February 2016 the British Postal Museum and Archive (BPMA) became 'The Postal Museum' as part of the build up to the opening of the new Museum in 2017. The Post and Go Machine labels were modified from that date to include the new name and the introduction of the Museums new logo. The designs are the Machin (with small logo), Union Flag and Heraldic Beast - Lion (large logo). The use of a new self adhesive substrate with additional security feature started to appear in January 2016. 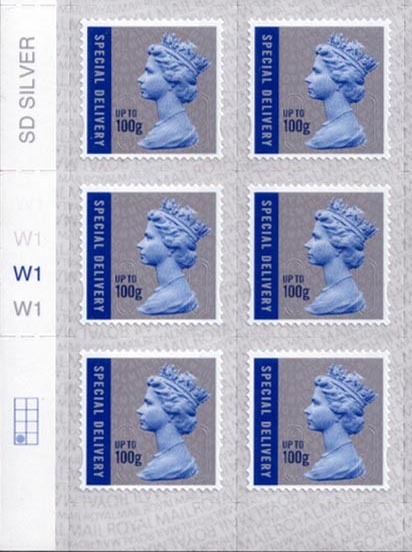 This takes the form of the 'ROYAL MAIL' wavy line text under the stamps - on the carrier paper. Initially, this was found on second class NVI Business Sheets ( 'MBIL' and 'MI5L'), however, the feature will be extended across the product range as new printings are produced. Counter sheets will not have this feature until mid 2016. Used versions of the 2nd NVI with the codes 'MRIL' and 'MI5L' started to appear in November 2015. These came from Large User Rolls of 10,000 used by bulk mailers. 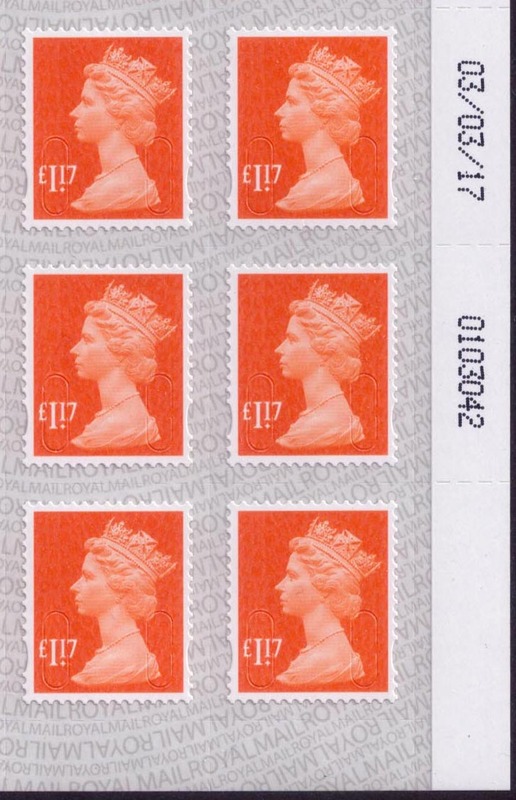 Mint versions came available in January 2016 and come on a pale greyish carrier with the reverse side numbered every tenth stamp.